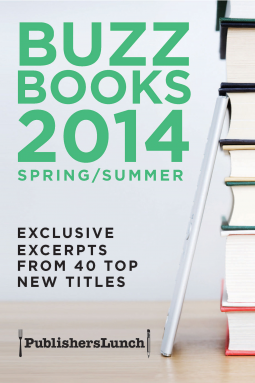 The fourth edition of Buzz Books includes 40 substantial excerpts from the most buzzed about books to be published spring/summer of 2014. Fiction, nonfiction, and young adult work is represented by all the major publishers. This volume coincides with one of the most important industry events, the American Booksellers Association’s “Winter Institute,” where dozens of authors appear. At the end of most excerpts, you will find a link to the full galley on NetGalley! Excerpts from new books include British authors Jojo Moyes (One Plus One) and Edward St. Aubyn (Lost for Words), alongside bestselling writers Robyn Carr (Four Friends) and Greg Iles (Natchez Burning). We preview Giller Prize winner Joseph Boyden’s The Orenda, plus novelists Jean Kwok (known for Girl in Translation) and Maggie Shipstead (author of Seating Arrangements). Highly-anticipated debuts include screenwriter Laline Paull’s The Bees and Marie-Helene Bertino’s 2 A.M. at The Cat’s Pajamas as well as a posthumous roman-à-clef from journalist Michael Hastings and bestselling narrative nonfiction author Ben Mezrich’s Seven Wonders. Selections are roughly organized by genre and then publication date. In addition, fill your to-be-read lists with the extensive preview of the entire publishing season. Instead of keeping that industry “buzz” closed off in the room with that small group of lucky booksellers, we’re giving everyone the same kind of access to checking out the newest voices the publishing industry is building for the next season. I LOVE these FREE Buzz Books 2014, 2 editions are now available! YOUNG ADULT AND ADULT ebooks available at Amazon, Nook, Kobo, iBookstore and NetGalley for FREE! I'm trying to get a feel for when the publishers put these out, but I don't have the exact time frame as to when they are released, 'yet'. Actually, I missed the timing on this book. I think this book might have been released in January because there was a slew of new releases of books starting at the beginning of March, April, May, June and a few in July, and by some of the titles listed in the description, those books have released already, or are almost ready to release. I am starting to think these books might release in January/May/September, but don't quote me on this, please. You will see, again in the description, they tend to release with large events that go on in the industry. The next Buzz Book will be for the Fall/Winter new releases, and it will also coincide with the BEA (Book Expo of America!) but I find it will most likely contain more books for release this Fall rather than Winter, at least that is what I found with last year's Fall/Winter Buzz Book. One great thing for this Fall/Winter 2014 is there will be "2" separate books like this. One book will ONLY be for Young Adult titles, and the second book will be for Adult titles. The publishers are separating the YA from the Adult, which I think is great! There are so many YA blogs out there, they will have their own dedicated books to choose from! The same goes for the Adult books! I think this decision to do it this way is wonderful! The publishers are able to get more books out and direct them to the people who like them best! What I find is so incredible about these Buzz Books is it gives us the complete first chapters of whatever number of books they include, such as this previous book contained 40 upcoming books to be released, in this case, for Spring/Summer, and they are now currently released, or are being released. What this does is gives us a good look at each book to see if we would like it, and if we did, we are able to request them directly from our E-Reader. I happened to find that every book I requested was available for review! The books format you will receive is in the ebook format, as that is how NetGalley works. ALL books are in the ebook format. Again, the BEST part is their availability at Amazon, Nook, Kobo, and iBookstore! Go for it! I'll have the links below for Amazon's Kindles or Fires! I also found the books in this book are not always available in the general catalog from NetGalley as you browse through it. The only way to get some of these books is by reading this book. Last year's Fall/Winter book was like that. I found SO MANY AMAZING books and new authors I had not read before, and the first chapters hooked me in! I requested the ebooks, and I was extremely happy! I have gone on to connect with these authors on their websites, Facebook pages, and Twitter! I have also bought and read other books they have written as well. I find these books to be very valuable reading for my blog, too, as I post the reviews on it, along with, of course, posting the reviews at retailers, too. Another thing to note is most of the publishers do ask you to hold off writing your reviews until a specific date, usually a month before the book releases or the day the book releases and thereafter. What I did was I wrote the review and saved them in files by the name of the book with the release date, marked my calendar for when to post the review and I did it. I did not want to forget a single part of any of the books, and by writing the review right away, I was more successful at getting the reviews out within the time the publishers prefer. This was my second book I have gotten, and even though I was a little to late to be able to request books from this book, I still was able to read the first chapters of these books. This book was for the Spring/Summer edition of books that are now releasing or will be releasing shortly. Grab these books as soon as you see them! Keep scrolling down to see the NetGalley Wellness Challenge you can still join in on! YOUNG ADULT VERSION - FREE! I have one more thing I would like to inform everyone of! The NEW 2014 NetGalley Wellness Challenge is on NOW! Head on over to the NetGalley Blog for the most recent Updates! I wanted to spell out the entire blog address for you instead of writing "Here". This way you can write it down, bookmark it when you get there, or do whatever you would like with it! It's for your convenience! I just stopped by their blog just now, and you will see this, a copy and paste about this year's Wellness Challenge! Please go there as there is so much more to read about! Now go on over and read the rest of what they have to say and JOIN the Wellness Challenge!